Have you spent years admiring your friend's handiwork on a beautiful quilt, scrapbook, or outfit? Everyone knows someone that can sit at a sewing machine and turn a few dull pieces of fabric into a work of art worthy of hanging onto the wall. If you're thinking about jumping into sewing as your new hobby or you'd like to buy yourself (or a loved one) a cheap sewing machine, fear not. It's possible! You can get a great sewing machine for less than $100 if you know what to look for. We've laid out exactly what you'll need to get the most bang for your buck when you hit the stores in search of a sewing machine. *Based on prices as of January 2018. Prices may vary on a later date. Are $100 Sewing Machines Considered Cheap? What Can I Sew with a $100 Machine? Singer 1304 Start Free ArmHandy Sewing Machine with 6 Built-In Stitches: best overall sewing machine under $100. Brother XM1010 with 10 stitches & Instructional DVD: best inexpensive sewing machine with included instruction. SINGER 2259 Tradition Easy-to-Use 19-Stitch Sewing Machine: includes most amount of built-in stitches. Brother JX2517 Sewing Machine: best inexpensive portable machine. Brother Sewing SM1738D Sewing Machine with Disney Faceplates: best for kids and adults to learn together. When you start shopping for your new sewing machine, you’re going to need to keep your eyes open for a few factors that can influence whether or not you’re getting the most out of your $100. You’ll want to have convenience, multiple stitch settings, and strong bobbin winding capabilities on your mind when you hit the store. This may sound obvious, but a good sewing machine will do a lot of the work for you. Of course, you’ll have to use some elbow grease to bring any of your projects to life, but you want to have your eyes on convenient features that make an affordable sewing machine a must-have. Built-in stitches. This will make your life easier, especially if you're new to sewing. When you're looking at these machines; the more, the merrier. Don't settle for a machine that has less than five built-in stitches if you'd like to get your money's worth. Automatic Needle Threader. Even the most basic sewing machines have an automatic needle threader. If your machine is equipped with an automatic needle threader, it’ll save you plenty of time on your projects in the long run. An automatic needle threader can help you get your project done faster and save you the pain of having a pricked finger from trying to do it manually. Adjustable Presser Foot. This is important to have because you'll need to be able to easily and quickly decide how tightly you'd like the machine to hold onto your fabric, you'll also need it to attach zippers or to complete your quilting projects. Top Load Bobbin. In a lot of machines, bobbins are underneath the needle plate of the sewing machine, and replacing your bobbin can be frustrating and time-consuming if you own a machine that doesn't have a top-load bobbin. Save yourself time and energy and look for a machine that has a top-load bobbin so that you can simply drop the bobbin into the top of the sewing machine. Free Arm. You’ll want to look into purchasing a sewing machine with a free arm, with this protruded piece of the sewing machine, you can work on pieces that have a round shape like cuffs and armholes. You need a sewing machine with various stitch settings, and you'll notice that a lot of more expensive sewing machines include a lot of built-in stitches. However, you're going to be looking for a sewing machine for less than $100, and you're not likely to get quite as many stitches. You want to get a sewing machine with at least five or more built-in stitches, and you should double check that you can quickly adjust your stitch setting with the help of an LCD screen or a precise rotating dial. If you're lucky enough to have a top-loading bobbin, you'll maximize the value of this sewing machine by seeking a unit that can wind the bobbin for you and without any mistakes. This type of machine will help save you time and enable you to start projects faster. When you shop for a sewing machine or compare your findings with other people that have been sewing for a while, you might find that $100 or less is pretty cheap for a sewing machine. A lot of high-end sewing machines like the Janome Mod-100 Sewing Machine can cost up to $800. If you can find a sewing machine that comes with an automatic needle threader, top load bobbin, free arm, multiple built-in stitches, an adjustable presser foot, and some other necessary and time-saving accessories for less than $100, it's a pretty good deal. Granted, your $70 sewing machine may not last as long as a sewing machine that retails for $200 or more, but you can always double check that your sewing machine has a good warranty before you make your final decision. You may think that because you purchased a machine on the cheap end, that you're limited regarding the projects that you can take on. You can still complete plenty of projects with a $100 sewing machine, although you may not be able to tackle especially large projects. However, you’ll be in luck if you plan on making baby quilts, throw pillows, monogrammed handkerchiefs, or tote bags. A $100 sewing machine is perfect for a beginner. If you're a beginner or an expert, it's not a bad idea to practice your sewing ability on a quilt for the newest addition to your family. Since most less expensive machines are smaller, they work well when using on smaller projects like a baby quilt. Additionally, if you’re a beginner level sewer, a small project like a baby quilt will be pretty easy to make and practice on as you learn more about your new machine. You can use your smaller machine to make throw pillows. This is an easier project for your new sewing machine to handle because you can make a throw pillow with the help of stuffing in just a few steps. You can probably accomplish this with sewing machines well under $100 as well, given this is the perfect type of project for a lower-end to a middle of the road sewing machine. Monogrammed handkerchiefs are an especially cool project to make with your new sewing machine, and a $100 sewing machine can help you get the job done easily while allowing you to practice your sewing skills. In fact, when some sewing machines come with some built-in stitches, they might come with a specific monogram stitch. If you find a sewing machine with a monogram stitch setting for under $100, it's a must-have machine. You can create monogrammed handkerchiefs and many other things with your sewing machine. If your new, cheap sewing machine is on the smaller side, it’s perfect for small projects like tote bags. You can make a tote bag with just four pieces of fabric, two to go on the inside of the bag, and two to go on the outside of the bag, and you’ve got a perfect gift. If your new sewing machine is small enough you could even use your brand new tote bag to store your sewing machine inside of in a pinch. Why You Should Buy It: The Singer 1304 normally retails for around $75, which makes it a perfect contender for our list of high-quality sewing machines that cost $100 or less. This machine comes with six built-in stitches and is perfect for beginners or experts that would like to purchase a second sewing machine. It's the perfect sewing machine for beginners; it's very easy to use because of features like it's automatic needle threader. The Singer 1304 is only around 12.8 lbs, which makes it a good option for kids that are learning how to use a sewing machine. You can easily move this sewing machine from place to place, so if you're teaching young relatives how to sew, they can easily tote this back and forth while visiting. The needle isn’t as strong as some of the more expensive sewing machines on the market. Some buyers felt the instructions on how to use the Singer 1304 weren't very clear. A few customers complained that the bobbin on this machine would not stay in place. The Singer 1304 is excellent for beginners, and it's a good match for kids because of its size. Additionally, if children are going to be using this machine, it's fortunate that it's only around $75. The Singer comes with a one-year warranty. Many customers reported that the machine lasts for a long time. This sewing machine is lightweight and portable, which add to its list of positives besides the biggest one - it's inexpensive price tag. The Singer is a reliable option if you're hoping to get into sewing, you'll enjoy easily making handkerchiefs, quilts, and baby blankets with this smart buy. Why You Should Buy It: This portable sewing machine comes with plenty of features that make it well worth the money. It comes with a quick-set-drop-in-top bobbin and diagrams to help you learn how to thread the machine and more. It's lightweight; it only weighs 12.9 pounds. Consumers say that it's a sturdy and strong machine, which is excellent, but it also comes with a one-year warranty in case your particular model doesn't hold up. It’s easy to use for both experienced and beginner level sewers. The integrated light inside of the machine isn't very bright and could be troublesome for users with vision problems. The machine sacrifices some of the sturdiness that other users praise it for by having plastic feet and only one metal foot. The Brother XM1010 is a good choice for sewers that are either new to sewing or won't be sewing very often. Experts will undoubtedly have high expectations, and because of the XM1010'S value price, it may not be able to deliver in some areas. However, experts might be impressed by this machine if they are looking for a portable machine that can cut through multiple layers of light fabric. Additionally, a lot of the XM1010's features are easy to use, and an expert may be able to get past some of its flaws like the dim integrated light. For beginners, the machine is ideal because of the price and easy to use features, and this sewing machine also comes with an instructional DVD that you can use to help you better understand the machine. Why You Should Buy It: The SINGER 2259 is a good option to consider when you’re shopping for a sewing machine because it comes with 19-stitches, four snap-on presser feet, and a 1-year limited warranty. This is a lightweight, and portable sewing machine. It only weighs 13.6 pounds. It comes with an easy to use the foot for button-holes. It’s super easy to set up once you pull it out of the box, you won’t have to wait long before you can use it. This sewing machine does not come with an automatic needle threader. Although it has a front-loading bobbin system, many customers complained that it was still difficult to use. Some buyers felt that although this sewing machine is from a respected brand (Singer), it’s doesn't perform as well as it should. The Singer 2259 19-Stitch Sewing Machine is ideal for beginners because of the cost, but a more experienced sewer might be better off with it because of its quirks. However, if you're usually a fast learner, you can always use the instructional DVD that comes with the machine. It's a portable machine, so it's still perfect to practice on once you've found your bearings. 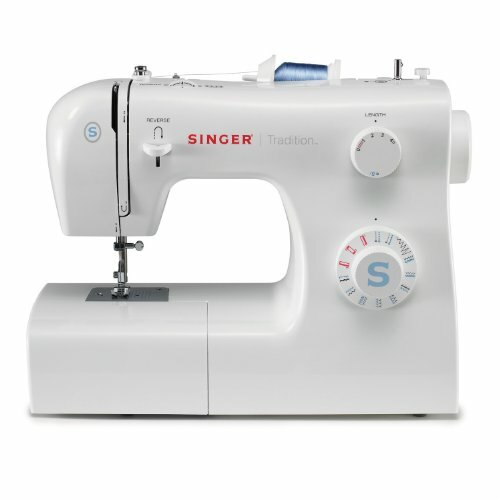 The Singer has 19 built-in stitches, along with a few other features that are designed to make your sewing experience easier. You can use this small, but powerful machine to create small projects, but experienced sewers might be happier with either a more expensive machine or a portable sewing machine by a different brand. Why You Should Buy It: The Brother JX2517 Sewing Machine is a great portable sewing machine for beginners and casual sewers. It's perfect if you're not ready to commit to a full sized sewing machine. The machine is light-weight, and although it's advertised as a good tool for casual sewers, a lot of buyers felt that it did a great job with mending clothes, drapes, and curtains. This sewing machine comes with a one-year warranty. The Brother JX25217 is equipped with 17 built-in stitches. Some buyers complained that the stitches came loose on some of their projects. The bobbin is challenging to work with and might move around inside of its case. While Brother usually makes pretty high-quality sewing machines, the JX25217 does have its quirks. However, you can't beat the price compared to some of the higher priced sewing machines on the market. There are some features on the machine that might be difficult for a beginner to navigate, but once you conquer the learning curve, it’s still a good practicing tool. It’s also described as a good sewing machine for casual sewing jobs, but you could probably get away with sewing handkerchiefs and tote bags with this machine. Why You Should Buy It: You can enjoy the whimsical art of Disney while you sew with this machine! It has 17 built-in stitches and four sewing feet- a zigzag foot, a buttonhole foot, a button sewing foot, and a zipper foot. This fun machine comes with an LED light that will help light up your workspace as you work. It comes with 17 unique stitches and a quick-set-drop-in top bobbin. It comes with a convertible free arm that makes sewing sleeves, cuffs, and hems a breeze. The presser foot is plastic, and it needs to be raised and lowered more often than it should be. This machine’s bobbin isn’t a universal fit, so if you break the bobbin from this machine, you must buy another one from Brother. Additionally, the operator’s guide’s tips for navigating this bobbin aren’t very easy to understand. The Brother Sewing SM1738D Sewing Machine with Disney Faceplates makes for an excellent gift for a child who’s going to be practicing their sewing alongside an adult. It’s also a great choice for longtime lovers of Disney movies, and buyers will enjoy more than the appearance of the machine. The machine’s easy stitch selector (you can select your stitches with the help of a dial), quick-set drop-in top bobbin, LED light, and additional sewing feet make it a steal. This machine is ideal for some of the projects that we listed above like making a baby quilt, tote bag, or monogrammed handkerchief. There are plenty of options to choose from when you start looking for an affordable sewing machine. For $100 or less, you can find a sewing machine that will allow you to do small projects like tote bags, scrapbooks, or monogrammed handkerchiefs. If you're a beginner, you'll want to reference this list and keep factors like convenience, multiple stitch setting, and bobbin winding capabilities in the back of your mind when you shop for a sewing machine. Also, you want to be sure that your sewing machine has a solid warranty. If you’re just looking for another sewing machine that won’t cost you more than $100, there are a lot of different options out there that cater to experts, and each sewing machine can also serve as a teaching tool for a child. Regardless, we think that you’ll be in good hands with any of our five favorites. Happy Sewing!